The Contract Signing Ceremony between The Royal Bangkok Sports Club (RBSC) and Christiani & Nielsen (Thai) Public Company Limited (CNT) for the construction of Main building and M&E works for the RBSC’s new sports pavilion took place on November 24, 2016. The luxury 2-Storey Sports Pavilion, comprising of a total floor area of 3,064 sq.m., is located on 1st Henri Dunant Street in central Bangkok. Present at the ceremony representing the RBSC were Mr. Nigel Oakins, Chairman (4th left), Dr. Karoon Chandrangsu, General Committee (3rd left) and Mr. Russell Blagg, General Manager (2nd left). Representing CNT were Mr. Khushroo Kali Wadia, Managing Director (4th right), Mr. Thanin Srisethi, Assistant Business Development Director, Special Projects (3rd right), Mr. Andrew Dunshea, Head of Hospitality and Residential Business Unit (2nd right), Mr. Chuchai Janumpakul, Senior Manager Hospitality and Residential Business Unit (1st right) and Mr. Nirun Tangsermwong, Project Manager (1st left). Key Projects Awarded in October – November 2016. 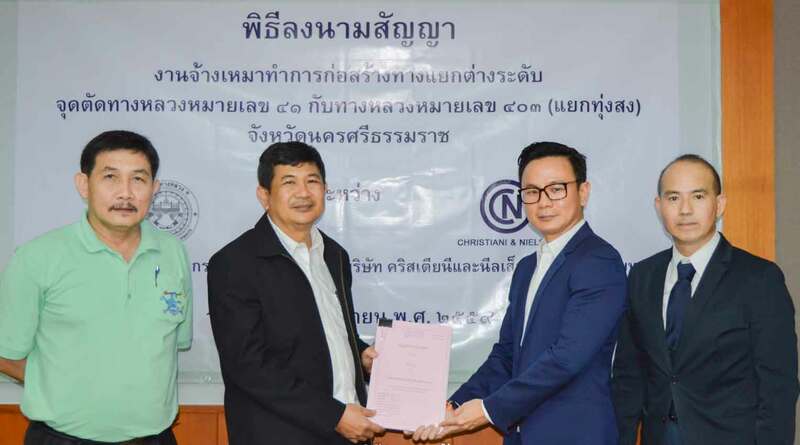 Internet Thailand Public Company Limited awarded Christiani & Nielsen (Thai) Public Company Limited the further construction works of their High Security Facility Building. The scope of works comprise of Civil work, Structure work, Architecture, MEP and External Works for their Data Center consisting of a total floor area of over 11,000 sq.m. The project is located in Saraburi. Kabinburi Glass Industry Co., Ltd. awarded us the Construction of their Batch House Building which includes a cullet tower, conveyor bridge, batch silos and MEP works. The project is located in Rojana Industrial Park, Prachin Buri Province. Nestle (Thai) Ltd. awarded Christiani & Nielsen (Thai) Public Company Limited the design and construction of a new waste water buffer tank consisting of a MBBR tank, anoxic tank, chemical sludge tank, bio-sludge holding tank, blower room and minor modification. The project is located in Bangpoo Industrial Estate, Samut Prakan. Key Projects Awarded in September 2016.
brand and consists of 125 keys located in prime area on Sukhumvit 23, Bangkok. Deputy Director Bureau of Bridge Construction presided over the auspicious event. Key Projects Awarded in August 2016. The Royal Bangkok Sports Club (RBSC) awarded Christiani & Nielsen (Thai) Public Company Limited the construction of Main building and M&E works for their new 2-Storey Sports Pavilion for their golf course with the facility comprising of a total floor area of 3,064 sq.m. on 1st Henri Dunant Street, Central of Bangkok. McKey Food Services (Thailand) Ltd. have awarded Christiani & Nielsen (Thai) Public Company Limited the main construction works for their New Processing Plant which consists of Main Building works of approximately16,700 sq.m. and relevant utilities. The project is located in Phanatnikhom, Chonburi. Key Projects Awarded in July 2016. Primo Posto Co., Ltd. recently awarded CNT the contract to construct the Structural, Architectural and External works for their new headquarters consisting of a Commercial Building & Car Parking comprising of Building A (6 storey), Building B (12 storey), Building C (6 storey), Building D (7 storey). The facility’s total area is 72,982 sq.m. and is located on Prasert-Manukit Road, Bangkok. Perfect Companion Group Co., Ltd., a famous pet feed manufacturer in Thailand, has awarded us the tender to construct the Structural, Architectural, MEP and External works for their new 1-storey Warehouse and 2-storey Office, with total area of approximately 4,000 sq.m., in Muang District, Phitsanulok Province. Key Projects Awarded in June 2016. Doi Kham Food Products Co., Ltd. has awarded Christiani & Nielsen (Thai) Public Company Limited the contract to construct the Royal Factory Warehouse Extension and relevant facilities buildings to expand its operations. The project scope includes additional warehouse space, renovation works of the existing Warehouse as well as supporting external works. The facility is located in Fang District, Chiangmai. Boston Avenue (1987) Co., Ltd. awarded us the contract to construct the Structural, Architectural and M&E works for their Sports Complex and Shopping Mall comprising of 2 Buildings of 4 and 5-Storey total area 8,925 sq.m. located on Krungthep Kreetha Road, Bangkok. Key Projects Awarded in May 2016. GAC Thoresen Logistics Ltd. awarded Christiani & Nielsen (Thai) Public Company Limited the turnkey design and construct contract for the GAC Warehouse Expansion for their existing facility located in Amata Nakorn Industrial Estate, Phase 9, Chonburi. The project scope includes building 10,126 sq.m. of warehouse space, renovation works of the existing Warehouse and supporting external works. Thai Union Manufacturing Co., Ltd. awarded Christiani & Nielsen (Thai) Public Company Limited the contract to construct the Civil, Structural, Architectural and M&E works for their New 8-Story Office Building comprising of a total floor area of 8,313 sq.m., located in Samutsakhon. The Association of Siamese Architects Under Royal Patronage had great honor awarded Christiani & Nielsen (Thai) Public Company Limited to construct a new Multipurpose Building located at Rajaprajanugroh 47 School in Sam Phraya, Cha-am District, Phetchaburi. This building had been donated by Rajaprajanugroh Foundation Under Royal Patronage. 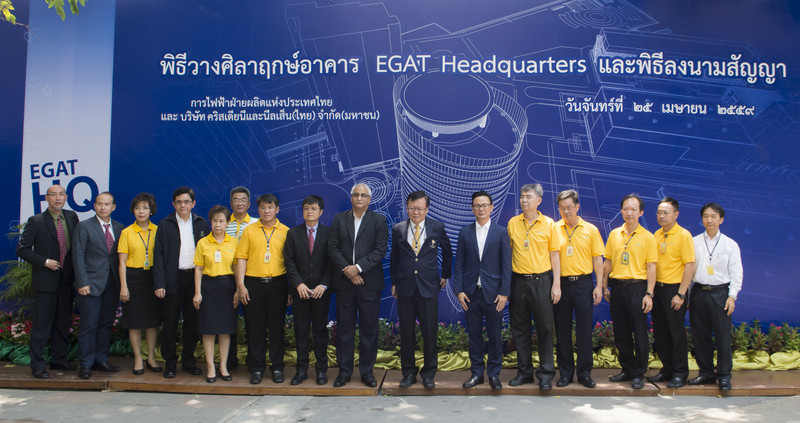 The Foundation Stone Laying Ceremony and Contract Signing Ceremony for the construction of EGAT Headquarters between Electricity Generating Authority of Thailand and Christiani & Nielsen (Thai) Public Company Limited on April 25, 2016. The guest of honor Mr. Soonchai Kumnooksate, Governor of Electricity Generating Authority of Thailand (center) presided over the auspicious event. Representing Christiani and Nielsen (Thai) PCL were Mr. Khushroo Kali Wadia, Managing Director (3rd right), Mr. Surasak Osathanugraha, Assistant Managing Director (3rd left ) and Mr. Pongsak Dittapongpakdee, Head of Government Works Business Unit Director (2nd left ). Key Projects Awarded in April 2016. Ek-Chai Distribution System Co., Ltd. awarded Christiani & Nielsen (Thai) Public Company Limited the contract to construct the main building and external works for TESCO Lotus Jor Hor, located in Amphoe Mueang, Nakhon Ratchasima. The works consists of a 2-storey building and supermarket with total floor area 9,200 sq.m. Mega Home Center Co., Ltd. awarded Christiani & Nielsen (Thai) Public Company Limited the contract to design and construct New MegaHome Store, A Leader of Center supplies comprehensive furnishings, located in Amphoe Mueang, Nakhon Phanom. Key Projects Awarded in March 2016. Ek-Chai Distribution System Co., Ltd. awarded Christiani & Nielsen (Thai) Public Company Limited the contract to construct the main building and external works for TESCO Lotus Bueng Sam Pan, located in Phetchabun. CPRAM Company Limited, a subsidiary of Charoen Pokphand Group (CP Group), awarded Christiani & Nielsen (Thai) Public Company Limited the complete construction works for their new ready-to-eat food products manufacturing facility consisting of an approximate total floor area of 12,600 sq.m. The new facility will be located in Pathumthani. Internet Thailand Public Company Limited awarded Christiani & Nielsen (Thai) Public Company Limited the complete construction works for phase one of their High Security Facility Building consisting of a Visitor Center and Office, Data Center, Utility Building and External Works. Their new facility is located in Saraburi.